What Is Facebook Tagging ? 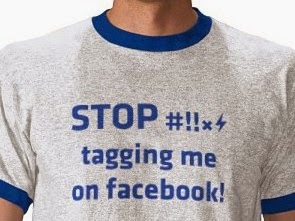 If you have read the above paragraph then you might have know what does facebook tagging mean? Tagging is working same as sharing something with your friends. But there is a little difference between sharing and tagging. So if you want to know what is the basic terminology of sharing and tagging according to Facebook, then read the below definitions. Sharing: Sharing something on facebook is limited to a single person at one time. It concluded, A user will repeat the process again when he wants to share something with another friend. It does not give the option of multiple friends whenever to share something. Tagging: Tagging is the fastest way to share something on facebook with multiple friends simultaneously. A user can share something with 45 friends simultaneously.. Therefore bloggers are often talking advantage of tagging when share their posts or news with friends. Some facebook experts already aware with this trick, how to disable or stop tagging on facebook timeline, but i am dedicating this tutorial to those who are curiously want to know, how to stop facebook unwanted tagging from your friends. 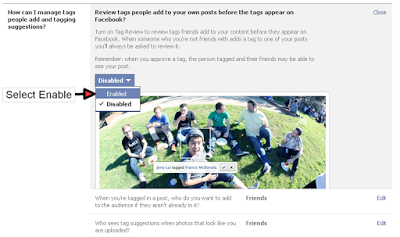 follow the below given step by step guide how to completely stop tagging on facebook timeline. 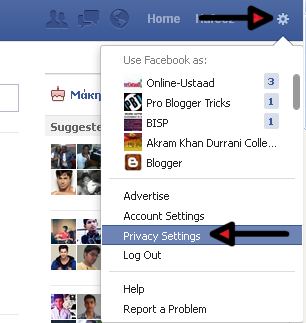 Go To Your Facebook Account and Click on Privacy option from the list. Now Click on Edit option as you see in the below screenshot. Now after doing this customization, whenever someone tags you, video or photo that will be hold-up for your review until you approve them to show on timeline. But be remember one thing, you have not been fully controlled the tagging yet. When we select this option, our friends can still tag us, but this time they will appear anywhere on facebook but will not show up on your own facebook Timeline until you decide to approve or not. When you approve, then the photo or video will be visible on your Timeline.